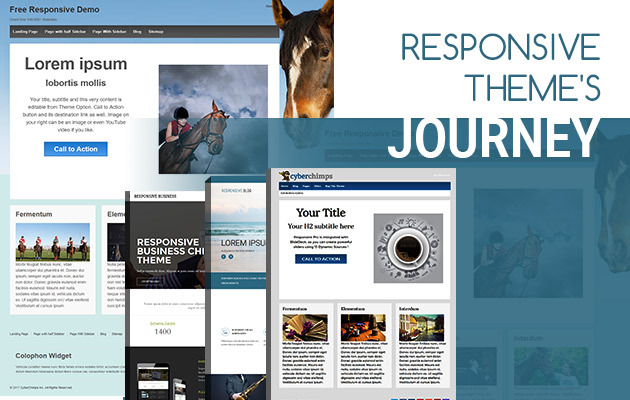 There is a plethora of free responsive WordPress themes out there, which is great, of course. It can be hard, though, to determine whether a free responsive WordPress theme is trustworthy and of high quality. 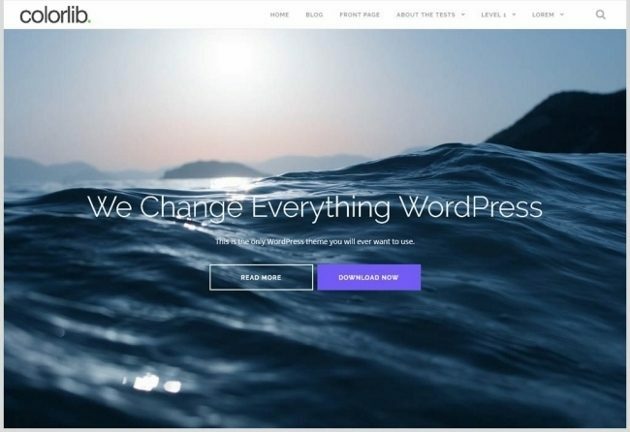 A quick Google search for “free responsive WordPress themes” will yield tens of millions of results, most of which claim to be the absolute best WordPress theme out there that has a responsive layout and is available for free. To help you select the perfect theme for your WordPress site, we have compiled 22 beautiful free responsive WordPress themes. 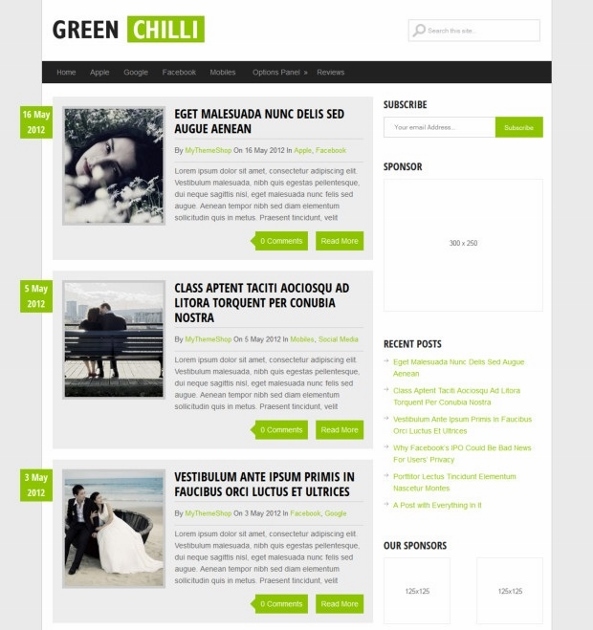 GreenChilli is a stylish WordPress theme that loads fast and is well-optimized for search engines. It focuses on simple and clear content and therefore is a perfect fit for bloggers. In addition, the GreenChilli theme is highly customizable and comes with loads of custom options, such as buttons and banners, to help make your website look exactly how you want it to. 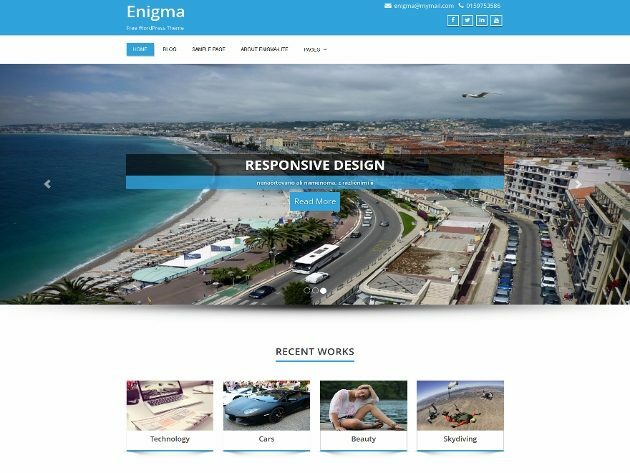 Enigma is a fully responsive, usability-focused, multipurpose WordPress theme. This free theme can be used for just about any type of website, from a personal blog to an online portfolio and a business website. Good to know is that the Enigma theme is compatible with WPML, which makes it easy to build and run multilingual websites, and with WooCommerce, a free eCommerce plugin. Awaken is an elegant, clean, magazine-style WordPress theme that comes with a whole bunch of customization options, allowing you to tailor your website to your own specific needs. 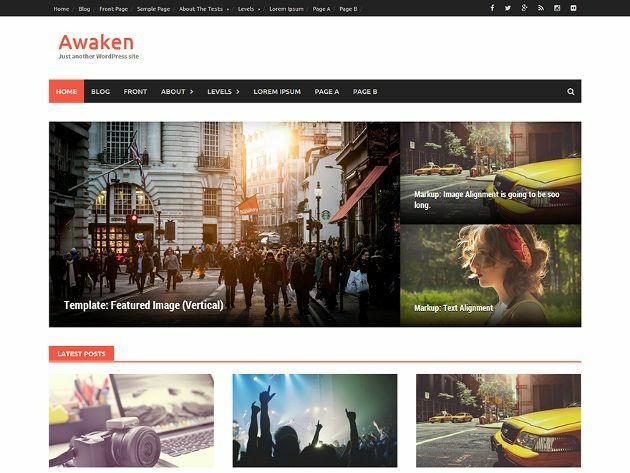 With the Awaken theme’s modern look and its great news layout with multiple widget areas, you can be assured that your content gets the attention it deserves. 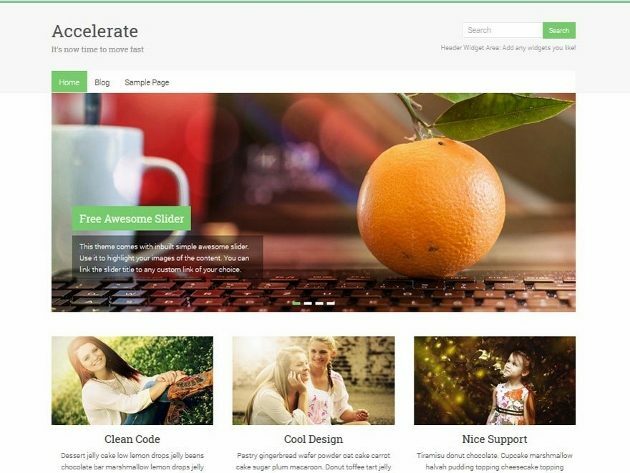 Accelerate is a 100% responsive WordPress theme that has a premium look and feel and can be used for multiple purposes. The Accelerate theme is simple and clean, easy to customize and free to use, which all makes this theme great for anyone and everyone. 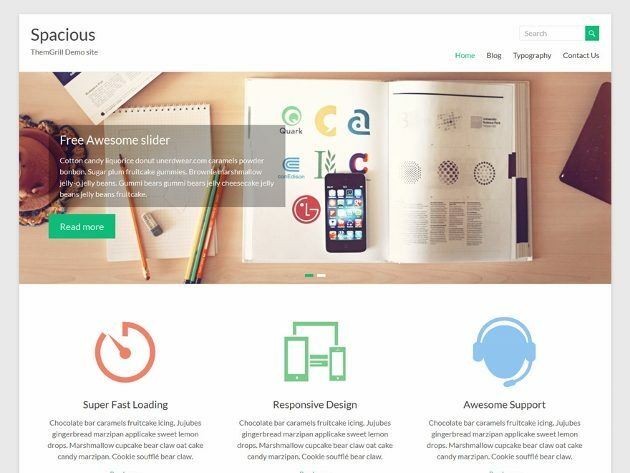 Tracks is a beautiful, fully responsive WordPress theme with one column layout. 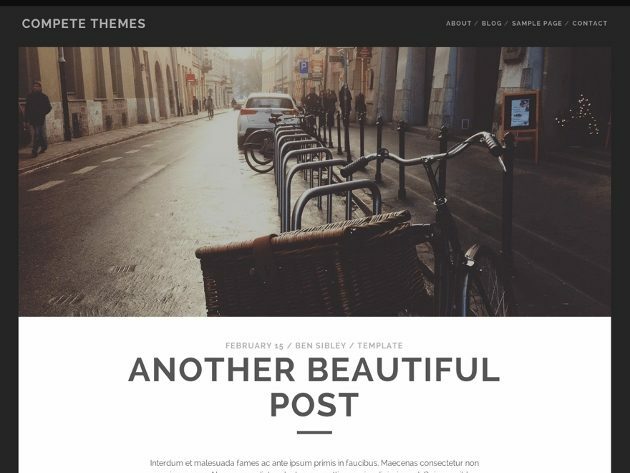 This theme is especially great for use as personal blog, magazine and photography website. The free Tracks theme comes with social media buttons and you can upload your own logo. If you are looking for more customization possibilities, you can easily switch to the paid theme. 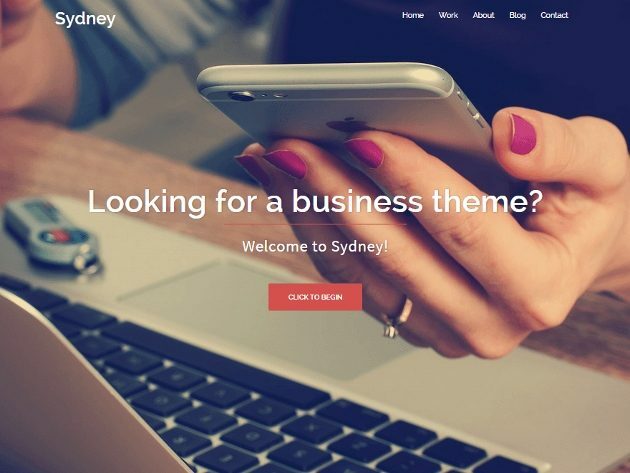 Sydney is a powerful business theme that was created especially for companies and freelancers. This free responsive WordPress theme comes with a whole bunch of customization options, such as full color control, layout control, full screen slider, header image, sticky navigation and much more. In addition, Sydney is the perfect solution to easily create a stunning home page. 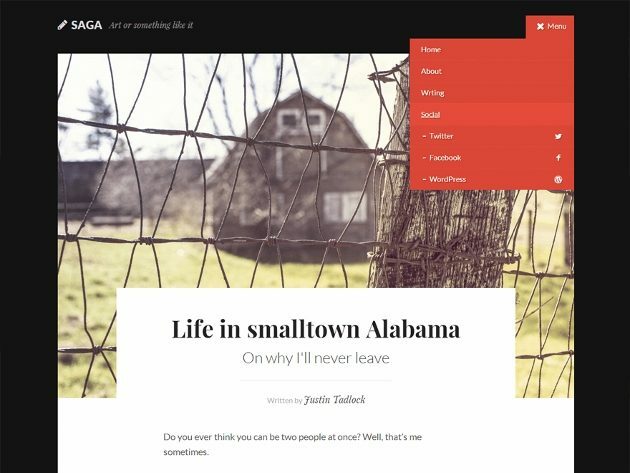 Saga is a fully responsive WordPress theme for bloggers and writers. It was designed to help you simply tell your story without having to worry about the technical details. The Saga theme comes with beautiful typography and several easy-to-use customization options to present your content in a stylish way. 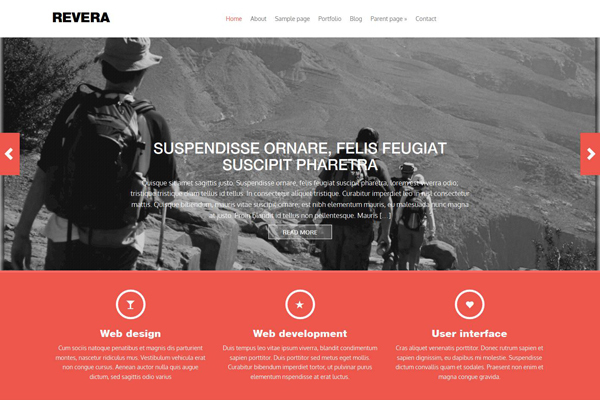 Revera is a free responsive WordPress theme with a premium feel and look. It comes with a whole bunch of theme customization possibilities, such as the option to set sliders, portfolio items, homepage widgets and banners. 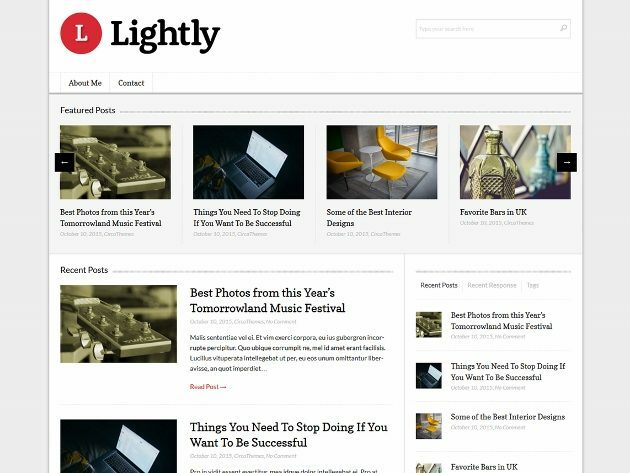 Lightly is a content-driven, minimalist WordPress theme that was created especially for magazines, newspapers and bloggers. With its clean and modern feel, its abundance of white space and its many great features, you can be assured that the Lightly theme will make your content shine. Shapely is a 100% responsive one page WordPress theme. It can be used for multiple purposes, such as business, landing page, portfolio and eCommerce. The Shapely theme comes with a whole bunch of customization options and several homepage widgets for adding testimonials, parallax sections, call for actions and much more. Sparkling is a free, SEO-friendly flat design WordPress theme that is optimized for smartphones, tablets, desktops and any other device. With its pixel perfect design and the awesome widgets and full-screen slider that come along with this theme, the Sparkling theme will definitely make your website stand out. 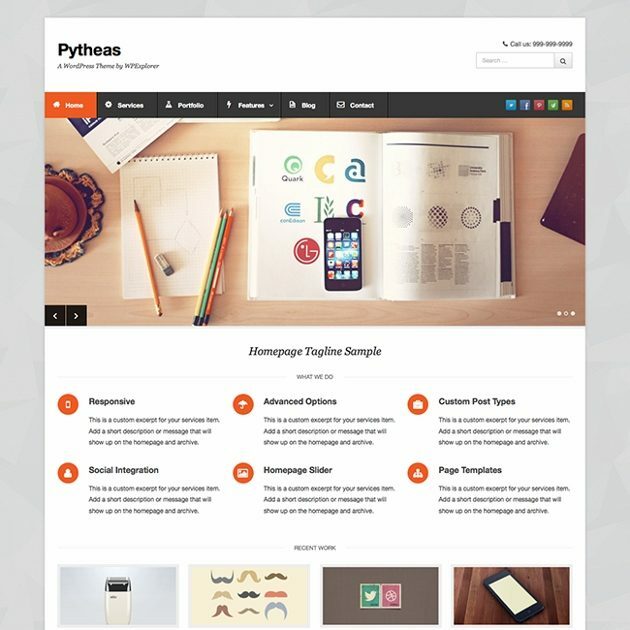 Pytheas is a fully responsive WordPress theme with a minimal design. It is an ideal theme for corporate, business, and portfolio websites. Although the theme doesn’t have a whole lot of customization possibilities, with the built-in color customizer and the custom background and header options, it is still perfectly possible to make the Pytheas theme match your brand. 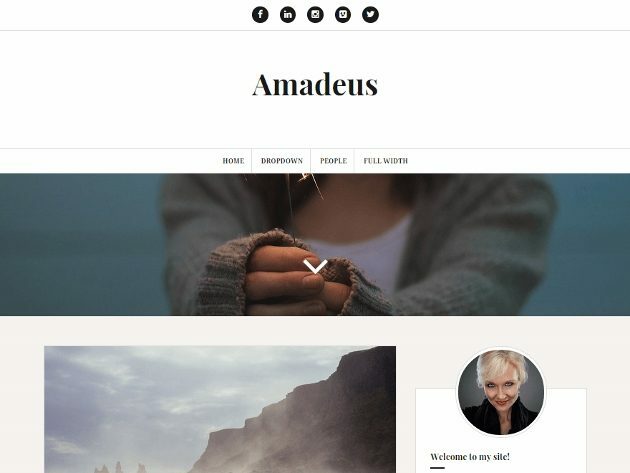 Amadeus is a free, image-focused WordPress theme with a simple yet elegant design. This modern theme is fully responsive and, for great personalization, the Amadeus theme comes with a parallax header image, Google Fonts integration option, social media icons, 100% color control, custom widgets such as a video embed widget and much more. 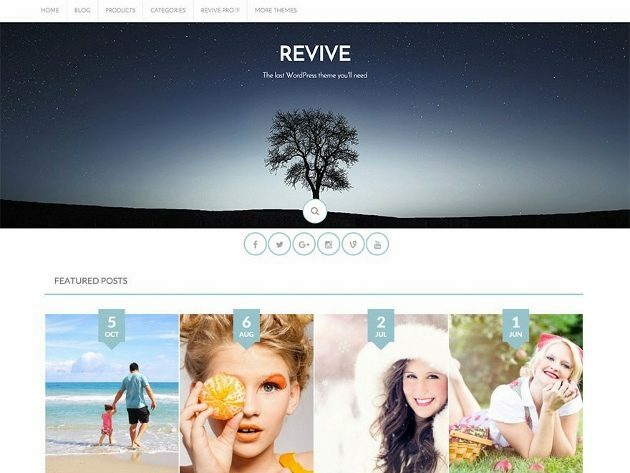 Revive is a stunning 100% responsive WordPress theme that can be used for multiple purposes. It comes with hundreds of Font Awesome icons, several blog layouts, sidebar customizations, social media buttons and much more. In addition, the Revive theme includes a homepage slider. Palmas is a free WordPress theme that is perfect for bloggers and those who love to write. The theme is completely responsive and makes clever use of white space, which results in a unique and aesthetically pleasing design. If you want your blog to have a simple and clean look and a theme that looks great on any device, the Palmas theme makes a great choice. 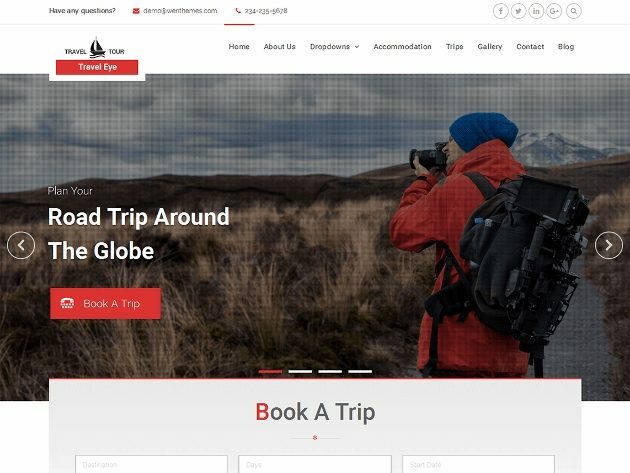 Travel Eye is a fully responsive WordPress theme and due to its heavy use of images, it perfectly fits for travel-related websites such as travel agencies. Thanks to the built-in theme customizer, this theme is easily adjustable to your needs. In addition, the Travel Eye theme is powered by Page Builder by Site Origin, which makes it drag-and-drop easy to create your perfect page layout. 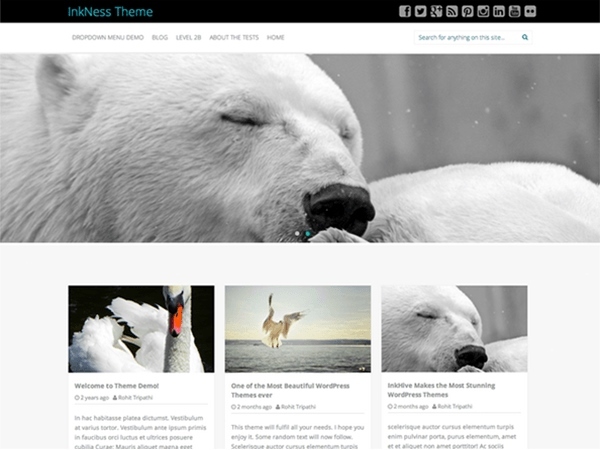 InkNess is a free responsive WordPress theme coming with a plethora of features. It has a modern look and feel and is compatible with all possible devices. The InkNess theme is an ideal theme for personal and corporate websites in basically any niche, as long as you select the right images. Spacious is a 100% responsive multi-purpose WordPress theme with, as the name suggests, a spacious look and feel. This simplistic and clean theme is a combination of a tasteful amount of white space and powerful pictures. Thanks to its many features and possibilities, the Spacious theme is a great fit for just about any type of website. 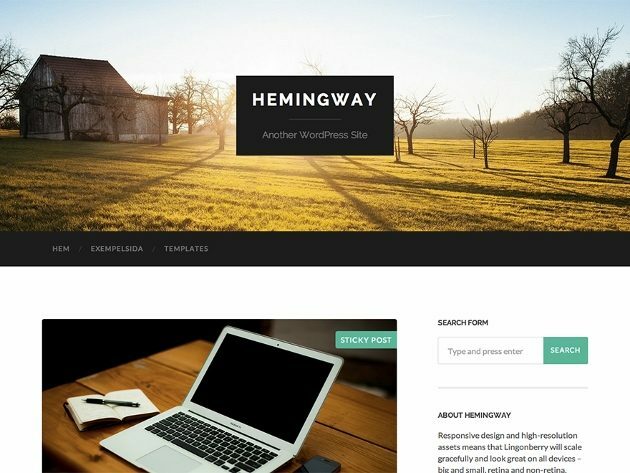 Hemingway is a clean, free WordPress theme that is perfect for bloggers. This extremely classy and elegant theme comes with full responsiveness, full-width header image with parallax scrolling effect, custom color options, custom logo upload, custom widgets, and like it’s not enough, the Hemingway theme includes several ready-to-use page templates. 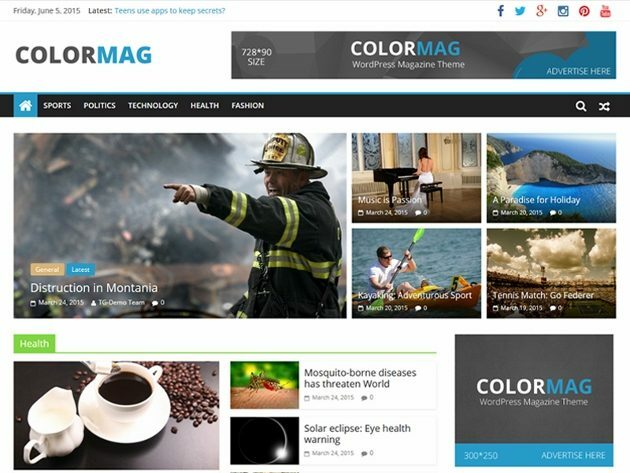 ColorMag is a modern free WordPress theme. The theme comes with many great features such as logo upload, custom header image options, custom color options and much more. 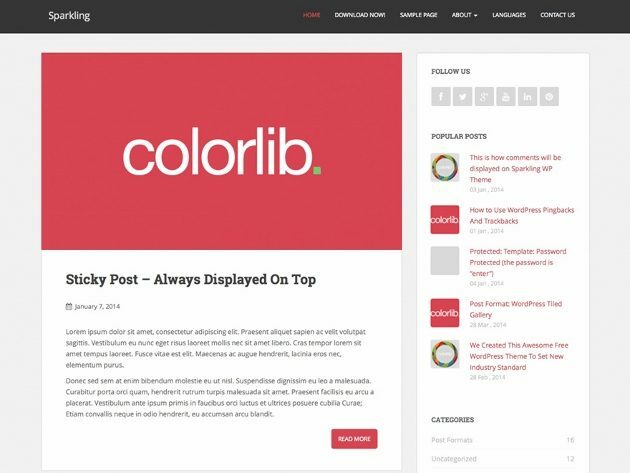 With its 100% responsiveness and unique magazine design, the ColorMag theme is the absolute perfect fit for digital content publishers, online magazines and bloggers. Estelle is a minimal, feminine WordPress theme with a simple yet unique design. This fully responsive theme is easy to work with and comes with some great features such as logo upload, custom header background option and widgetized sidebars and footers. 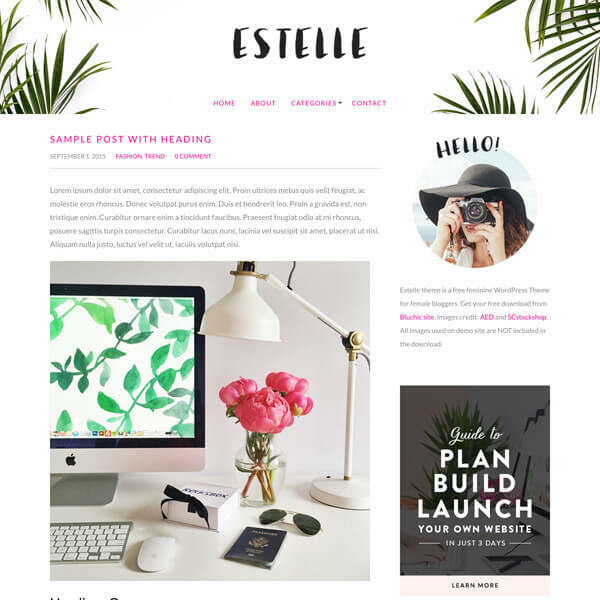 With plenty of whitespace and a pretty minimalist design, the Estelle theme is a wonderful choice for content-focused bloggers. 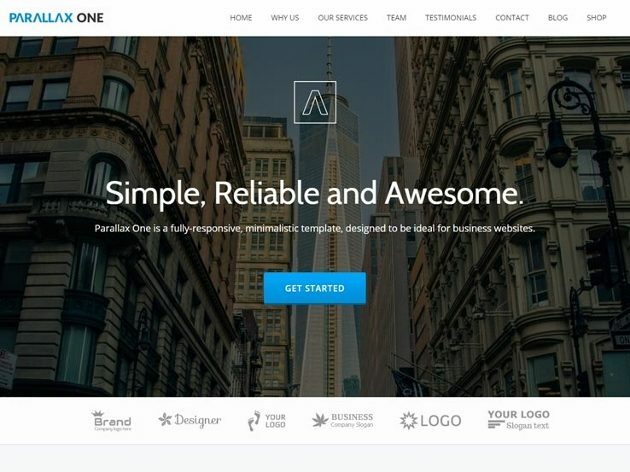 Parallax One is a free one page WordPress theme. This business theme has a very clean and professional look and comes with 100% responsive design, awesome parallax effects, unlimited color options, client testimonial integration and contact information display options. Parallax One is a perfect fit for companies and freelancers who want a unique, memorable and aesthetically beautiful website. For more information about the Parallax One theme, take a look at WP Mayor’s Parallax One review. That’s it for this compilation of the top 22 free responsive WordPress themes. 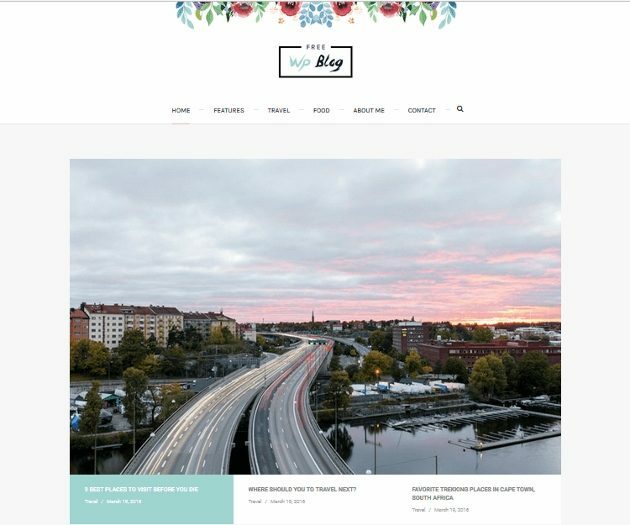 If you didn’t find what you were looking for, WP Mayor also has a post on the best premium responsive WordPress themes. I would love to hear your thoughts on this list. Are there any free responsive WordPress themes that should definitely be added? Jeroen Van Gils is a web designer at iWebDesign, a European web design agency, and a freelance writer with a huge passion for all things Internet marketing. In addition, he is the founder of Recent.Reviews, a review site that helps people discover what industry experts are saying about companies and, by doing this, aims to make it easy for people to understand if companies they are considering fit their needs. Good Collection Jeroen Van Gils. It is very hard to find out some cool and classic WP Template but our journey is end here. Thank you for putting all good work here.